Finance 101 for Kids, by Walter Andal. My BoM for the New Year is more practical than imaginative. 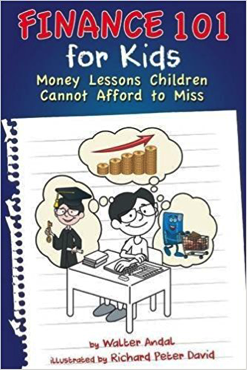 I chose this book because I was looking to introduce the concepts behind money to our own children. It is an ideal introduction to a subject that is encroaching increasingly on young lives. Talking about money tends to be put off until later and by then it’s much harder to get teens enthused when they’d rather be in bed sleeping. So start them young, when they have the interest and energy, by giving them an insight into how finance fits into their lives. It’s too important just to leave it to Kidzania! Walter Andal has put together the information in an entertaining way that will appeal to kids and will help parents talk things through little by little. In fact, I think the subject is so important I would like Yellowbird to add a ‘Kidscoin’ course to our range of courses in 2018. Watch this space.